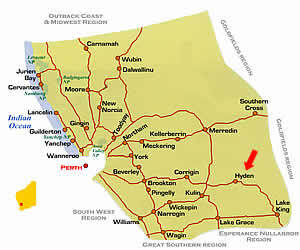 Hyden is a small town, 350kms from Perth. Its main attraction is Wave Rock. Formed over 60 million years ago, Wave Rock stands 15 metres high and 100 metres long. There are many Aboriginal Cave Paintings in this area as is the famous Rabbit Proof Fence. Also worth a visit is the Stargate Observatory, where you can observe the majestic Southern Skies.